The Best Kids Christmas Party Ideas are Full of Good Clean Fun. Looking for kids Christmas party ideas that keep them entertained as well as interested? Planning a Christian based party doesn't have to be alot of work. The main responsibilities are to get the games or activities scheduled beforehand in order to have a great party that flows. Christmas Songs, Skits, Games and Devotionals First, ask yourself if this an adult and kids combined Christmas party? Hosting a children's party that is combined with an adult party varies from those that are only for children. Combined parties require a little extra forethought and planning to assure all goes well. * Make sure you have a young adult or teen to help with games and activities if this is a adult/child party so you can be freed up to entertain the adults while the children's games are operating. Even if your Christmas party is for only children, is it still a good idea to have an assistant. * Schedule ahead of time the games and activities for the kids Christmas party. Preferably make lists on paper you can hand off to someone else. This gives you the opportunity to intermittently check on the young person who is supervising the children, but doesn't require you to be there continuously. Allowing you the option to host the adults as well. * Find a way to include a devotional, spiritual skit or game that works in and drives home the message that Christmas is about the birth of Christ, first and foremost. * Although kids love sweets, try to limit the amount of candy or sweets until later in the evening to keep the noise level and physical activity to a normal level. You don't want little ones climbing on furniture and skydiving because they are so pumped full of sugar. Besides it will make it more difficult for a young person to supervise if the kids are totally out of control. Some kids Christmas party ideas for snacks would be chips, popcorn, fruit dipped in yogurt etc. Send the candy home in treat bags at the end of the party. * Create treat bags and prizes for the games. 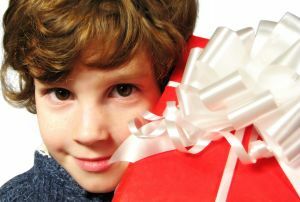 Kids Christmas party ideas for treat bags or favors needn't be expensive. Check at your local dollar store for stickers, small inexpensive toys and candy. * Find some really original games, songs, skits that haven't been overdone and are fun to play and get everyone laughing and having good, clean fun!! Remember to include something about the birth of Christ because he is truly the reason for the season. Below is a selection of creative kids Christmas party ideas that is highly recommended. Best of all there are so many of them that this resource can be used year after year. Enjoy and have fun with it!! !